Vancouver, British Columbia, Canada – HAWKEYE Gold & Diamond Inc. (the “Company” or “HAWKEYE”) (TSX.V-HAWK; Frankfurt Ticker: HGT; WKN: A12A61 ISIN: CA42016R3027): is pleased to announce assay results from its recently completed Phase 2 work program at HAWKEYE’s 100% owned McBride property. 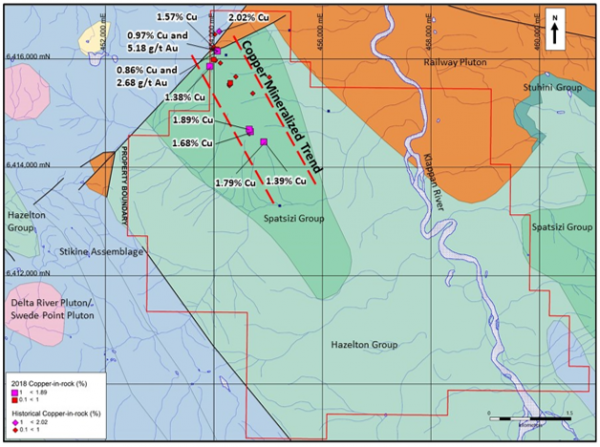 The McBride property totals 4,133 hectares, is contiguous with the Red Chris Mine property of Imperial Metals to the south, and lies only 18 km east of GT Gold’s exciting “Saddle” discovery, where recent drilling yielded an intercept of 1.02 g/t Au, 0.51% Cu and 1.72 g/t Ag over 363 m.
The program was conducted on the Company’s recently acquired claims announced on October 5, 2018 (News Release No. 297 – 2018), which border the northern and eastern sections of the original McBride claims. The campaign was designed to further assess mineral showings, both historical and newly discovered, that were examined during HAWKEYE’s first phase program. A total of 11 mineralized rock samples were collected, mainly from the previously outlined two kilometer copper mineralized trend (see Figure 1 below). 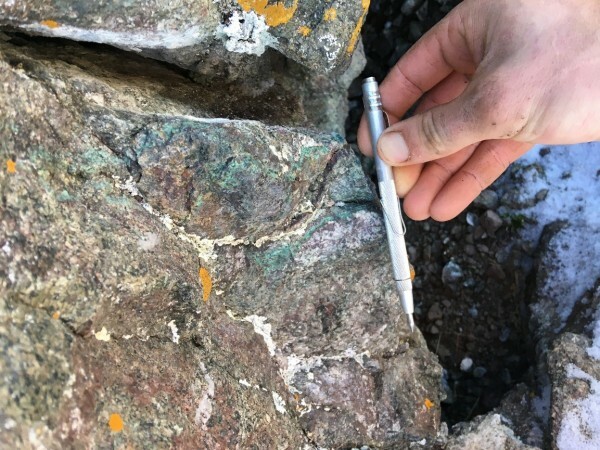 In the northeastern part of the trend, two samples from narrow copper-bearing carbonate veins hosted by a monzonite plug or large dyke returned 5.18 g/t gold and 0.97% Cu and 2.68 g/t Au and 0.86% Cu, respectively. Encouraging results were also returned along the copper trend, with samples returning copper grades ranging from 0.248 to 1.89%. Within the copper mineralized trend, a coincident 500 m wide by 2000 m long linear magnetic high was outlined by Geoscience B.C.’s Quest-Northwest Airborne Magnetic Survey (Figure 2). This magnetic high may reflect the presence of a partially covered monzonite intrusion. The copper and gold grades along the copper mineralized trend, together with widespread propylitic alteration and the coincident airborne magnetic high, may represent the upper and/or distal parts of a potentially sizeable porphyry copper-gold system at depth. 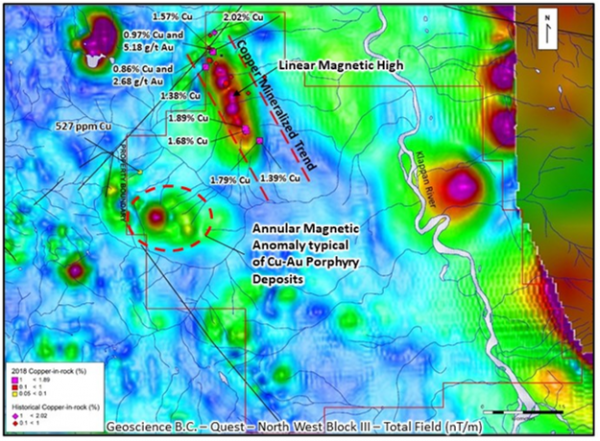 A second magnetic anomaly consisting of an 1000 by 1000 m annular magnetic high, typical of Cu-Au porphyry deposits in this district, is located approximately 1.5 km southwest of the two-kilometer copper mineralized trend (Figure 2). A grab sample of hydrothermally altered intrusive rock collected about 600 m northwest of the magnetic high hosts fine grained disseminated pyrite and chalcopyrite and yielded 527 ppm Cu. Nearby country rocks are moderately to strongly propylitically altered and are commonly dyked by quartz-carbonate-specularite veined and altered rhyolite, which may also be indicative of a nearby porphyry centre. Above: Gold-bearing calcite vein with chalcopyrite and malachite within medium to coarse-grained monzonite, northern McBride property. Above: Close-up of gold-bearing calcite vein hosting chalcopyrite and malachite, northern McBride property. Above: Close-up of gold-bearing calcite veins hosting chalcopyrite and malachite staining, northern McBride property. 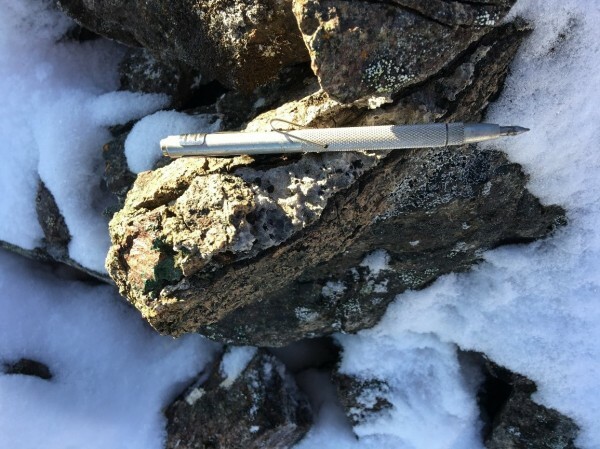 HAWKEYE is currently reviewing proposals for a 2019 airborne magnetic and radiometric survey, which, together with existing Phase 1 and 2 geochemical surveys, should help outline potential porphyry-related targets. More detailed follow-up soil geochemical and ground-based Induced Polarization geophysical surveys are planned for early in the 2019 season, with the aim of identifying specific targets for a 2019 drill program. All soil and rock samples were delivered directly by the crew to ALS Global’s analytical facility in Terrace, B.C. for preparation, and subsequent precious metal and multi-element analysis in their North Vancouver laboratory. ALS Global in North Vancouver, British Columbia, Canada, is a facility certified as ISO 9001:2008 and accredited to ISO / IEC 17025:2005 from the Standards Council of Canada. Figure 1: Two kilometer copper mineralized trend (between red dashed lines) with copper-gold highlights from historical, Phase 1 and Phase 2 programs. Technical information in this news release has been approved by Andrew Mitchell, B.Sc., P. Geo., a senior geologist with CJG and a qualified person for the purpose of National Instrument 43-101. Mr. Mitchell has prepared, reviewed and validated that the technical information contained within this release is accurate. HAWKEYE Gold & Diamond Inc. is a junior mineral exploration and development company based in Vancouver, British Columbia, Canada. 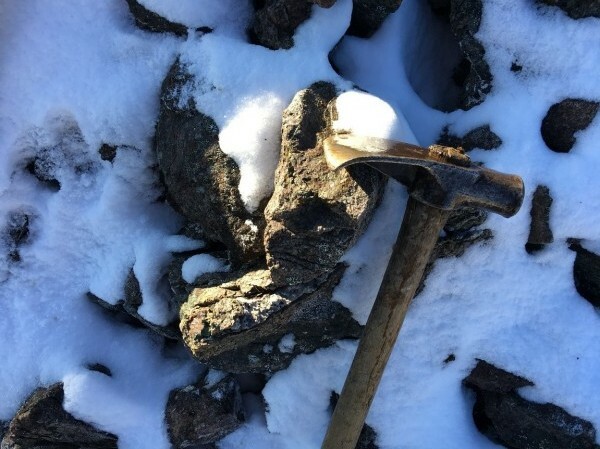 The Company’s precious and base metals properties are located in the prolific BC Golden Triangle, world-class Barkerville gold camp and Vancouver Island, BC, Canada. HAWKEYE’s corporate mandate is to build strong asset growth and shareholder value through the acquisition of low-cost, high-potential cash flow and production opportunities with blue sky discovery potential, and to manage our business in an environmentally responsible manner while contributing to the local community and economy.